Heel size. Because I inspect every shoe inside and out. I use bright studio lighting to inspect and photograph. You will never receive dirty shoes. They are ready to wear right out of the box. Shoe Body. I am eclectic, a lover of all things new and old. I Am Not A Seamstress. HEEL APPROX. CLEAN AND SMOKE FREE! Interior of shoe is in great condition. Style: Slingback Rounded Toe Heels. Heel Height: 3. Material: Leather. IN BROWN TEXTURED LEATHER. SEMI-ROUND TOE. SLIP ON STYLE. Writing on outsole for inventory purposes. SIZE 6 1/2 B. THEY DO RUN SMALL. THEY HAVE A NICE 3 1/4" TALL HEEL. I DID NOT TRY AND REMOVE THEM. THE HEELS ARE IN GOOD SHAPE WITH THE EXCEPTION OF A SMALL NIC ON ONE SIDE. VERY NICE HEELS WITH PLENTY OF GREAT LIFE LEFT. BLACK VELVET PEEP TOE PLATFORM BLOCK HEEL SHOE. 3 1/2" leather covered block heel. Platform: 3/8". Left shoe's side folds in when not worn. Wear on bottom sole. Aralda Heels. Made inItaly. - Composition: Fabric / Cork. No Box Included. - Adjustable buckle strap closure. - Heel height: 3.5". Made In Italy Size 6B. My loss is your gain! Style: Squared Toe Block Heel. Material: Synthetic. Heel Height: 2.5. Condition: Previously Loved In Good Condition See Pics.Previously Loved And In Good Condition: Free From Odors, Pet Hair, Stains, And Flaws. Condition: new in original box with card. No dust bag. Size: US 7. Slight scratches toe area, chip on left toe, light sole wear. Overall nice shape! Heel Height: 3. Style: De 36211 B66. Condition: Good. Manufactured: Florence Italy. Salvatore Ferragamo Womens Brown Faux Crocodile Leather Slip on Heels Size 6.5B. Condition is Pre-owned. Beautiful leather heels in excellent condition size 8,5 color is brown/cherry. Style: Block Heel Classics. Heel Type: Block. Color: Navy Blue. These are 2" High and the Size is listed as 9 AA Narrow. Style is 6526. Black snakeskin embossed leather uppers - wrapped heels. - Made in Italy. Navy Blue in color. Clean inside and out. Slingback style. Excellent pre-owned condition. Heel - 3 1/2". Black leather around sole of shoe. Olive green suede around the foot. Length: 9". Height at back of shoe: 5.25". Size: 9 AAAA. Style: Rounded Toe Block Heels. Heel Height: 2.5. Material: Leather. Condition: Previously Loved In Good Condition See Pics.Previously Loved And In Good Condition: Free From Odors, Pet Hair, Stains, And Flaws. These shoes belong to my sister. I took pictures from different sides and angles to show condition of the shoes. I try to do my best to resolve the problem. Pre-owned in very good condition. I will try to get back to you within a couple of hours. Preowned with normal signs of use. Slight wear of the soles. Very preowned condition. These are 1 3/4" High and the Size is listed as 9 AA Narrow. Style: Slingback Heels. Material: Leather. Condition: Previously Loved In Good Condition See Pics.Previously Loved And In Good Condition: Free From Odors, Pet Hair, Stains, And Flaws. 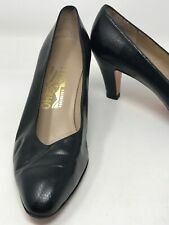 Salvatore Ferragamo Gray Pumps Block High Heel Women's Pumps US Sz 8.5 Soles show wear. Otherwise great preowned condition! Perfect for work or to wear with a blouse and jeans. Very comfortable. Style: Rounded Toe Block Heel. Heel Height: 3. Material: Leather. Condition: Previously Loved In Good Condition See Pics.Previously Loved And In Good Condition: Free From Odors, Pet Hair, Stains, And Flaws. Gray with Striations. Size 9 (2A). Leather lined. Fabric outside. Made in Italy. In excellent condition. Toe style: closed toe. Heel style: block/chunky. 3 1/4" (83mm) heel (size 7). Color: BURGUNDY. Suede upper, lining and sole. condition: new in original box. Size: US 7. Silk/ Satin wrapped shoes which are a gorgeous bronze color with hints of maroon and copper. The shoes are not sparkly but when photographed have a shine. Light wear on inside of shoes which is pictured.